The first Crossword Centre puzzle marked by our late friend Trevor was ‘Losing Track’, my tale of woe about a scratched record. At the time, prompting me with an album title, he suggested that I might repeat the exercise. I’m afraid I only just got round to checking my copy – but uncannily I find I do have the same problem here. Thirteen clues originally incorporated the titles of the album’s 13 tracks but (true to form for vinyl) all of the tracks have been scratched - solvers should therefore reinstate the missing titles before solving those damaged clues. In twelve other clues, an extra word needs to be removed before solving. First and last letters of these words in normal clue order suggest how to identify the album. 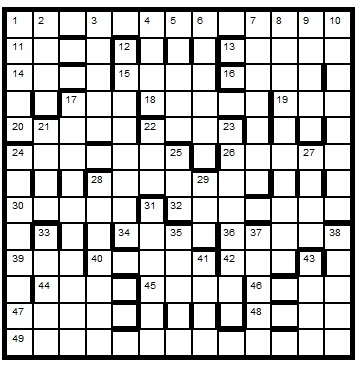 Solvers must highlight five thematic names appearing in the completed grid. Chambers Dictionary (2014) is the primary reference – and thanks for everything Trevor. Printable PDF version To enter this competition, send your entry as an image or in list format indicating the highlighted words, to ccpuzzles@talktalk.net before the 8th June 2016.The first correct entry drawn from the hat will receive a book from the Chambers range which has been donated by Chambers.